Last week I decided to wear every color of the rainbow because I'm a wacko. This was the first time I've worn these orange tights and it wasn't too bad. They were a bit bright for me and they aren't even bright...that should tell you something. 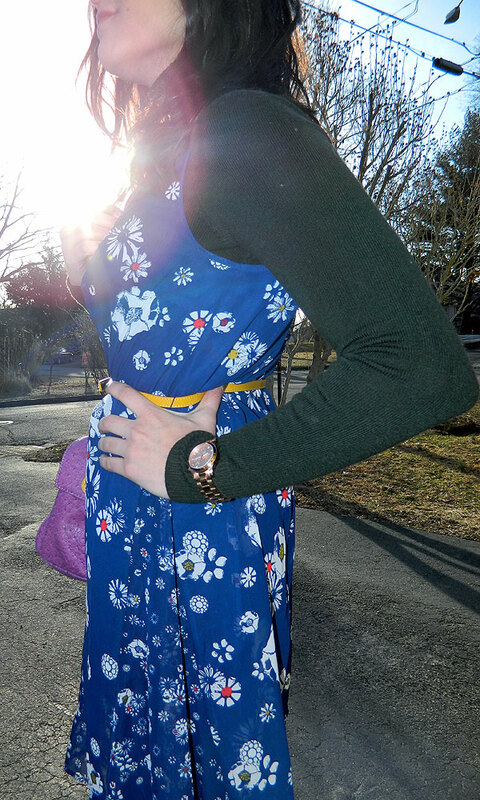 I couldn't wait for Spring to wear this Jason Wu for Target dress so I decided to layer it over my super comfy French Connection turtleneck. Have you ever donned a rainbow outfit or do you feel like its too clowny? I personally think it worked this time (except maybe the tights) but if any of my pieces were brighter it would go WAY off the mark and be a disaster. I think those leggings are adorable! Really brighten up the outfit! Great outfit.. love the colors!!! I think the orange/rust tights are totally working with this - it's a nice contrast to the pattern on the dress. Love the tights, love the bag! These are great colors. Beautiful dress! Loving the contrasting red tights! I like the tights! Please check out my post today on Oscar inspired fashions for less than $100. You totally pulled off this outfit!! Love it! great dress. love the belt. oh, and the colors! LOve the mix colour of your outfit dear!!! And you’ve got a gorgeous blog too!!! Daisy print!! How cheerful! love it! I love all the colors! 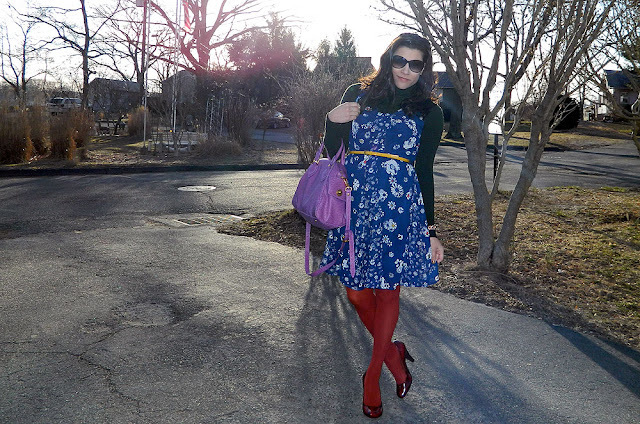 Great idea how you winterized that dress...especially pairing it with those red tights! This outfit is the perfect way to spruce up dark winter wear! So bright and fun! Fantastic mixing of colors here. You look so cute and so happy. Loving it. the tights totally work with this dress! You look great. Love your Jason Wu dress! Those tights look so good with that dress!! love the heading of your blog, did you do it? your bag is really cute!! Well, you might be a little bright, but still totally adorable! This outfit is so fun!